MCP mdl. MT50000 Stamping Oven s/n 101596. 2007 iPura High Pressure Tank s/n 3664. Euromatic AV220/4 Adjustable Angle 8 ½” x 8 ½” Hydraulic Notcher. Epilog “Legend 24” 50Watt Laser Engraver. Epilog “Mini” 24” x 12” 45Watt Laser Engraver. Lepel mdl. T-15-3-KCS-TL Type T-1501-112 15kW 400-450kHz High Frequency Induction Heater. Deckel GK21 Pantograph Machine s/n 55776. Ingersoll Rand Dual 15Hp Twin Pump Horizontal Air Compressor. (11)Vertical and Horizontal Air Compressors. C & M Horizontal Hydraulic Baler. Fellows Involute Measuring Instrument s/n 27248. MBA mdl. N-200-3628 Dry Blast Cabinet s/n 2406399. Kelco mdl. CS-22-C Dry Blast Cabinet s/n 01754. Rayzist Dry Blast Cabinet s/n 203432007-3. Torit mdl. 75-80 Dust Collector s/n 97006. Sauborn NF1000S Wash Tank s/n MD94-0955. Media Tumblers. (2)Bridgeport Vertical Mills s/n’s 155922, 107236. (3)Ex-Cell-O mdl. 602 Vertical Mills. Cincinnati “Tool Master” Vertical Mill. Cincinnati Milacron “Plain Dial Type” Universal Mill s/n 310434P77-0003. Vilh-Pedersen Type VPU2 Universal Mill s/n 122948. Sharp-KF mdl. KVH Universal Mill s/n 4342. U.S.Machine mdl.1 Horizontal Mill s/n 10895R. Moore No.3 Jig Borer s/n G1454. Moore No.2 Jig Boring Machine s/n 5248. (2)Lincoln Square Wave TIG 355 TIG Welders s/n’s U1940426445, U1971016508. Lincoln Square Wave TIG 255 TIG Welder s/n U1940818925. Miller CP-302 CV-DC Welding Power Source s/n LB102905. Miller Dialarc TIG-300-300 AC/DC Welding Power Source s/n AC471808. (2)Lincoln Idealarc R3S-250 DC Welding Power Sources s/n’s AC426632, AC277250. Century 140 MIG Wire Feed Welder 120 Volt. Esab “Power Cut 1250” Plasma Cutter s/n PN-J620063. Lincoln “Pro-Cut 60” Plasma Cutter s/n U1941004308. Acme Type PT1-12-75 75kVa Spot Welder s/n 6603. Victor Track Burner w/ Track and Table. 2000 York YCAS0200EC46XFADB Portable Chiller Unit s/n RAJM9430AA. 2001 Trane Intellipac CSRA0601BEO Portable Chiller Unit s/n D11948. York YCAS0250EC46XEADB Portable Chiller Unit. Schreiber 5CAC Chiller Unit s/n 4821. Vidmar and Lista Tooling Cabinets. Over 100 Crates of Punch Dies and Shoes. Set s/n J830682823 w/ 250kW, 88kVa. Yale LPG Forklift – Needs Work. Apex-Denison 20 Ton Hydraulic Stamping Press s/n 24053. Denison10 Ton Hydraulic Stamping Press s/n 10312-21701B-T7. Denison Multipress 8 Ton Hydraulic Stamping Press s/n 18214. Denison Multipress 8 Ton Hydraulic Stamping Press s/n 17932. Strippit Custom 18/30 Punch Press s/n 32383176. Cincinnati 75 Ton OBI Stamping Press s/n 51557. Amada/USI Torc-Pac 60 60 Ton Stamping Press s/n 73-0032. U.S.Industries/Clearing Torc-Pac Stamping Press s/n 3030. Dake/Norton Norta-Matic GB86 Hydraulic Stamping Press. Warco 50 Ton Stamping Press s/n 46736. Federal No.32 32 Ton Stamping Press s/n 32-561. Dual Press Co 72” Mechanical Press Brake. Federal F5 50 Ton OBI Stamping Press. 200Ton 25” x 41 ½” 4-Post Heated Platen Press . 30” x 30” 4-Post Heated Platen Press. Commercial Iron Works 24” x 30” Heated Platen Press. Commercial Iron Works 20” x 24” Heated Platen Press s/n 55-1714. Commercial Iron Works 20” x 20” Heated Platen Press s/n F1-1696. Bench Master and Kenco Bench Model Stamping Presses. (3)Excelsior No.10 Pneumatic Kick Presses. Marvel Series 15A4/M1 15” Automatic Hydraulic Horizontal Band Saw s/n E-151363. Startrite 316H 36” Vertical Band Saw s/n 20860. DoAll mdl. 36-2 36” Vertical Band Saw s/n 52-54185. (2)DoAll 36” Vertical Band Saws. Powermatic mdl. 87 24” Vertical Band Saw s/n 887422. Continental 100M 12” Horizontal Band Saw. Struder S35 13 ½” x 43” CNC Cylindrical Grinder s/n 20265. Blanchard No.18 Rotary Surface Grinder. Blanchard No.11 Rotary Surface Grinder. Estarta EE301 Centerless Grinder s/n 189. Struder Type RHU650 10” x 30” Cylindrical Grinder s/n 401.51. Norton 5” x 15” Cylindrical Grinder s/n 28457. Landis Type CH Plain 6” x 30” Cylindrical Grinder. Majestic ID/OD Grinder w/ Compound Grinding Head. Magerle Type F12 10” x 47” Automatic Surface Grinder s/n 345. Boyar Schultz Challenger H618 6” x 18” Surface Grinder s/n C-2376. Boyar Schultz Challenger H612 6” x 12” Surface Grinder. (3)Harig Super 612 Surface Grinders w/ Electromagnetic Chucks. K.O.Lee S612 6” x 12” Surface Grinder s/n 15707-EE. Sunnen MBB-1660 Honing Machine s/n 86473. Sunnen MBB-1600-MS Honing Machine s/n 44520. Deckel mdl. SO Single Lip Tool Grinder s/n 83560. K.O.Lee BS60-3-52 Tool and Cutter Grinder s/n 4232. Cincinnati mdl. LM Spiropoint Precision Drill Sharpener s/n 1LG6P5T-010. Max 18” & 16” Pedestal Disc Sanders. Burr King mdl. 760 1” Pedestal Belt Sander. Fosdick 13” Column x 40” Sensitive Radial Arm Drill s/n 21038. Ooya RE-1225H 13” Column x 40” Radial Arm Drill s/n OAO-4021. Wilton VSC Twenty mdl. 2025 Power Drill Press. Bakewell Size 2GE Precision Tapping Machine s/n C181. Moore Deep Hole Drill Press. Burgmaster mdl. IC 6-Station Turret Drill s/n 11043. Niigata EN40B 2-Pallet CNC Horizontal Machining Center s/n 16419. Mazak VQC-20/40B CNC Vertical Machining Center s/n 69096. Mori Seiki MV-40 4-Axis CNC Vertical Machining Center s/n 3085. 1998 Akira-Seiki Performa V-4A CNC Vertical Machining Center s/n 98VGN045-127. 1996 Fadal VMC2216HT CNC Vertical Machining Center s/n 9511268. (2)Fadal VMC4020 CNC Vertical Machining Centers s/n’s 8610543, 8509272. Matsuura MC-1000VS2 CNC Vertical Machining Center s/n 84013466. Matsuura MC-1000VS CNC Vertical Machining Center s/n 83063272. Matsuura MC-500V2 CNC Vertical Machining Center s/n 85055002. 2002 Haas TM-1 CNC Tool Room Mill s/n 28923. Brother TC-217 CNC Tapping Center s/n 111384. Anayak Anak-Matic-8-CNC CNC Vertical Machining Center s/n VMC-6549. 1991 Komo VR805HP 4-Head CNC Router s/n 623191. Lagun Deluxe 2-Axis CNC Vertical Mill s/n 40644. Boston-Matic mdl. 514-1 5-Axis CNC Vertical Mill s/n MB-546. Nakamura-Tome S-4BL CNC Turning Center s/n C41901. Nakamura-Tome Methods Slant 4B CNC Turning Center s/n C41001. Mori Seiki CL-150 CNC Turning Center s/n 119. 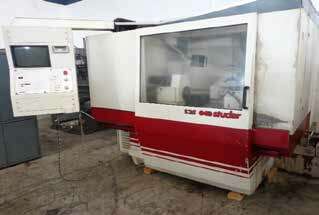 1995 Agie “Agietron Compact 1” CNC Die Sinker EDM Machine s/n 040.007. Iowa Precision 6’ x 10GA Slitting Line w/ Slitter, Shear, Straightener, Un-Coiler Coil Car. Union Sigma BFT80 Horizontal Boring Mill s/n 22969. Atrump K2V Vertical Mill s/n K2V-470. Acra FV-1 ½ TM Vertical Mill s/n 8411117. Mazak Yamazaki 21” x 87” Geared Head Gap Bed Lathe s/n 2240. Monarch 18BB 20 ½” x 96” Geared Head Lathe s/n 6765. (3)LeBlond Regal 19” x 56” Lathes s/n’s 8F2420, 6E293, 4-677. Monarch 20” x 54” Lathe s/n 42249. LeBlond Makino Regal 15 ½” x 58” Servo Shift Lathe s/n 14C411. Monarch 17” x 32” Lathe s/n 45926. Victor 1640S 16” x 40” Geared Head Gap Bed Lathe. Acra-Turn LS-400 16” x 40” Geared Head Gap Bed Lathe s/n 1-8312144. Logan mdl. 6561H 14” x 40” Lathe s/n 84302. Monarch 14 ½” x 20” Lathe s/n 24262. Clausing 12” x 38” Lathe s/n 503228. Monarch 10EE 12 ½” x 20” Lathe s/n 42281. Enco mdl. 112-8100 Turret Lathe s/n 250117. Craftsman 12” x 26” Lathe s/n 30424. Ammco “Super 6” Brake Drum Turning and Facing Lathe s/n 921. Van Norman No.803 Senior Brake Drum Lathe s/n 4313. Van Norman 204-71001D Brake Drum Lathe s/n 10282-0383B.